Handcrafted popcorn and sweet treats…one batch at a time. We specialize in kettle corn, specialty flavored popcorn, and a variety of seasonal treats that are just right for special occasions, gifts, corporate recognition, and everyday. Shop online, visit our shop, or visit us at one of the seasonal events or in retailers throughout Maryland. We’ve been making magic since 2010 — now let us add a little magic to your day! Visit our online store to order your favorite popcorn flavors today. Ship directly to friends and family for a tasty surprise. Our popcorn makes a great gift for any special occasion, or just because! Find The Caramel Kettle popcorn at retailers throughout Maryland and at fairs, festivals, and farmers’ markets. Our shop is located in historic Taneytown, Maryland, inside Thunderhead Bowling Center. Click the Find Us button to see where to find our famous popcorn and other sweet treats! And, follow us on Facebook to keep up with events, new products and special offers. 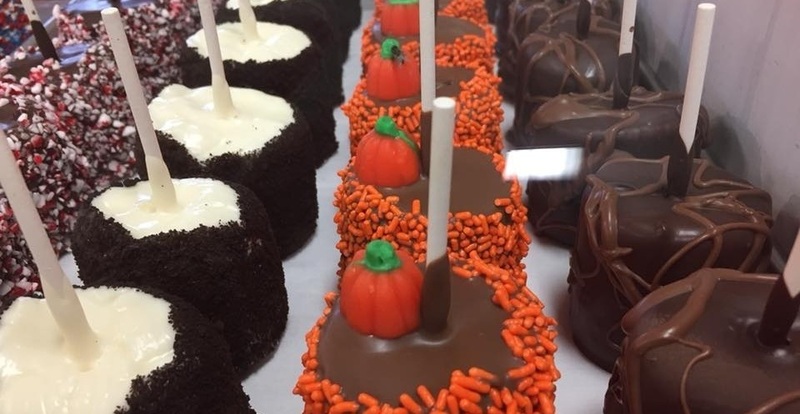 Besides Kettle Corn and specialty popcorn flavors, The Caramel Kettle makes specialty sweets, including frosted nuts, chocolate covered giant marshmallows, caramel and chocolate covered apples, gourmet chocolate creations, and cotton candy. These are available in retailers, festivals and farmers markets throughout the region, or visit the shop in Taneytown, Md.